Thayer's Gull: Large gull, gray upperparts, white head, tail, underparts. Bill is yellow with red spot near the end of the lower mandible. Wings are gray with white-spotted, dark gray tips. Legs are dark pink. Direct flight, strong, steady wing beats, soars on thermals or updrafts. Thayer's Gull: Nests on high rocky cliffs in the Arctic islands and north coast of Northwest Territories. In winter, usually found in bays, meadows, and beaches on the Pacific coast, from central British Columbia to the Baja Peninsula, but occasionally wanders east to the Great Lakes. The Thayer's Gull has become a more common winter visitor to the Great Lakes and the East Coast, but whether increasing reports are due to eastward movement of the species or to more birders being aware of this rare gull is not known. Both the common and species names honor ornithologist John Eliot Thayer. 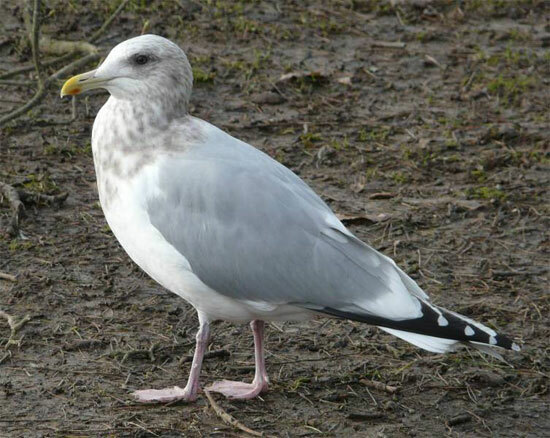 This bird has variously been considered a species of its own, a subspecies of the Herring Gull, a subspecies of the Iceland Gull, and even a hybrid of the two. At the moment, it is treated as a species. A group of gulls has many collective nouns, including a "flotilla", "gullery", "screech", "scavenging", and "squabble" of gulls.